The bracket came out on Sunday. The "First Four", or first round (this name is terrible) begins tonight. Second round games start on Thursday. Admittedly, this is a difficult time of the year for me. No, not because of some tragic event's anniversary or haunting reminder. The reason: college basketball. Having spent seven years involved in Division I women's college basketball, being around basketball teams and having friends that play, have played, or currently coach Division I men's basketball, it's tough to avoid basketball on a daily basis from October to February. It is impossible to escape in late February and March as teams are winding down their seasons and vying for automatic NCAA bids in their conference championships. It was a heart breaker seeing William and Mary lose in the CAA tournament final, as well as my Michigan State Spartans losing in overtime in the Big Ten tournament final. But it's always fun to see a team like Albany win on a last second shot by a guy who lost his mother within the past year, or a team like sub-.500 Hampton win the MEAC as a 6-seed. These small schools play mostly for school pride, with hopes of adding a bit more to each school's endowment, while seeing a spike in admission applications. The first four days of the NCAA tournament offer some of the year's best basketball games, with many of us watching or listening to a variety of games. Many of us picked our games in our brackets, filling out multiple brackets to cover for Cinderella scenarios or our Alma mater. Workplace productivity on that first Thursday and Friday of action often slows to a crawl. I have been blessed through basketball, without a doubt. For many basketball traditionalists, women's basketball is, at best, a fringe sport, but it provided me an experience many students never have as undergraduates Working in women's basketball doesn't sound impressive to many, but there are a great deal of former players, high school coaches and others who covet graduate assistant coaching positions, with the hopes of becoming a college coach. I was blessed to have that opportunity. I was able to gain experience in film editing, strength and conditioning practices and was afforded access to some of the best coaching minds in basketball. I also benefited from the physical activity of daily practices, the academic advantages of preferred scheduling and an abundance of athletic apparel. 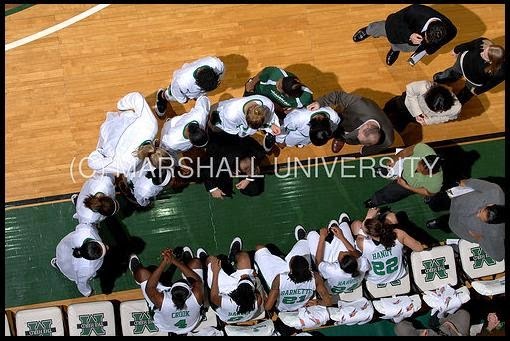 My experience at Michigan State led me to Marshall University, then William and Mary. I got to travel across the country, saw some fantastic cities, ate in great restaurants, and even went to Mexico and Colombia due to the game of basketball. These are all fine blessings themselves. But the danger of March is finding ourselves emotionally tied to the outcome of a 40-minute contest played by 18 to 24-year-olds; as if we have something on the line ourselves. Taking pride in a program's successes is fine, and being disappointed when they lose is acceptable too; but our emotions cannot use the game of basketball as their barometer. For the coaches, this is even more of a struggle, as their ability to provide for their families depends on their performance. Thankfully, for us as Christians, our right standing with the Lord and his acceptance of us is not based on our works, but through our faith in Christ, and His imputed righteousness. However, that radical grace is not demonstrated in the halls of athletic departments throughout the NCAA. If you want to see who's hiring, just check out the The Market on the NCAA's website. It's full of basketball job opportunities, and will have even more here in the next few weeks. (There are only 87 openings as I write this, but you can be sure there will be many more in the coming weeks.) Staff will lose their jobs, and the coaching carousel will continue. I remember the tension that existed following our losses in our conference tournaments, wondering whether or not I'd be able to continue graduate school or have a job that next week. It is almost assured that all of the coaches that you see on the sidelines in the NCAA Tournament will have the same jobs next year, or move on to a larger school. Of the 351 Division I basketball teams, 68 made the NCAA tournament, which means there are 283 other head coaches that must be concerned for their livelihood and families, not to mention each team's assistant coaches, operations staff, graduate assistants, office staff, or training staff. If a head coach is fired, you can be sure nearly every other staff member will be looking for other employment. Even those coaches that are successful at smaller colleges try to make a jump to bigger schools, and sometimes pay the price. Take Manhattan College coach Steve Masiello as an example. After getting to the NCAA Tournament with Manhattan College last year, Masiello was poised to become the new coach at the University of South Florida in the American Athletic Conference. He was a student at the University of Kentucky from 1996 to 2000, and listed on his resume that had graduated. However, further review showed that his resume was inaccurate and that he had not in fact graduated from Kentucky. You may not need a bachelors degree to coach college basketball, but questions of character sometimes speak louder than basketball coaching skills. (And, in my opinion, character should sit higher than simple basketball coaching skills.) Masiello and his Manhattan Jaspers won the MAAC conference tournament and will actually face Kentucky, Masiello's now-Alma-mater, if they beat Hampton in their first round play in game. Some coaches understand that losing a game in the NCAA tournament should not define you. Creighton University basketball coach Greg McDermott's post game speech after his team lost to Baylor last year should make us breathe a sigh of relief that there are some level-headed coaches out there who care for their players and staff. As we are in the thick of March Madness, remember that these coaches (both in men's and women's basketball) and their staffs are under tremendous pressure to succeed and to find definition by wins and losses. Please pray for them, their hearts, and for their families. Athletes in Action and the Fellowship of Christian Athletes faithfully minister to coaches and athletes (who are typically pretty stubborn and prideful due to their success in coaching), and will be doing so at the Final Four for both the men and women. I was constantly challenged by this tension of success and the pressure that basketball brings, and it is an ugly perspective to have. I am thankful that Christ's acceptance does not ride on wins and losses. So, I'll be watching this weekend again, just like everyone else, but with a perspective that the wins and losses in my bracket do not determine my identity in Christ or control my emotions. In closing, as a Michigan State graduate, the Spartans are my obligatory pick. If they struggle in the tournament, be sure to check in and see how I'm handling it. Go Green, Go White!